Jennifer Brown, president/CEO of Community Knights, was highlighted in Distinction magazine in the feature, “Women: Changing the world,” recognizing her involvement in the community. United Way of the Virginia Peninsula (UWVP) announced that four community agencies—Hampton Roads Ecumenical Lodgings and Provisions, Inc (H.E.L.P. ); LINK of Hampton Roads; Salvation Army, Peninsula Command; and Gloucester United Emergency Shelter Team (G.U.E.S.T. )—were awarded a $15,000 grant by a generous family foundation to purchase mats for the homeless population in the jurisdictions served by the UWVP: Hampton, Newport News, Gloucester, Mathews County, James City County, Poquoson, Williamsburg and York County. These four agencies work directly with the homeless population and are working together on the United Way of the Virginia Peninsula collective impact agenda with the goal of moving 10 percent of the population out of poverty by 2023. Dr. Sarah Childers has joined Virginia Living Museum as lead veterinarian. Childers is a graduate of the University of Tennessee, Knoxville, where she received her Bachelor of Science degree in animal science and her Doctorate of Veterinary Medicine degree from the College of Veterinary Medicine. She has joined the museum curatorial team on a part-time basis and works directly with museum staff and a team of local veterinary specialists who support the care of the museum’s animal population. Childers has completed training positions at the Tennessee Aquarium and the Knoxville Zoo. 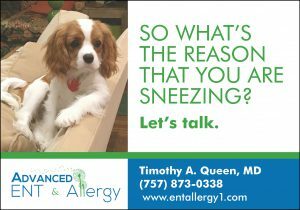 She is a member of the American Veterinary Medical Association and the Veterinary Emergency and Critical Care Society. She is also employed by the Peninsula Animal Referral Center. Habitat for Humanity Peninsula and Greater Williamsburg’s 15th Annual Raise the Roof Mardi Gras Style event is Saturday, March 2, 7–11 p.m., at Christopher Newport University’s David Student Union. Funds raised will go toward providing safe, affordable homes to low-income families and veterans on the Peninsula and in Greater Williamsburg with hopes of building two homes. Bon Secours Mary Immaculate Hospital has been named a Top General Hospital by independent hospital watchdog organization, the Leapfrog Group. The Top Hospital award is widely acknowledged as one of the most competitive honors American hospitals can receive. Mary Immaculate was recognized for its achievements in patient safety and quality. 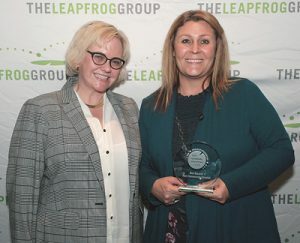 Shown here is Leah Binder, president of the Leapfrog Group (left) presenting the Top Hospital Award to Katrina Moog, process improvement specialist with Bon Secours Mary Immaculate Hospital. SOLitude Lake Management continued its annual HOLiday Cheer efforts through The SOLution, SOLitude’s corporate volunteering and outreach program, donating $8,280 worth of toys, clothes and other necessities to hospitalized children as well as five under-resourced families located throughout the country, bringing total donations through the HOLiday Cheer program to $37,450 since its inception in 2013. 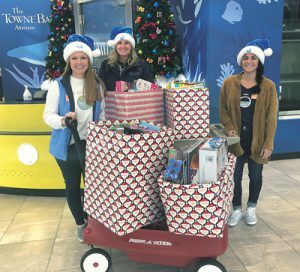 Alongside family contributions, SOLitude delivered gifts to children spending their holidays at The Children’s Hospital of Philadelphia (CHOP), Shriners Hospital for Children in Springfield, MA, and the Children’s Hospital of the King’s Daughters (CHKD) in Norfolk. BayPort Credit Union has joined the Newport News One City Marathon team as sponsor of the new half marathon race. The BayPort Credit Union One City Half Marathon debuts at the 2019 event and complements the other races, which include the marathon, marathon relay, 8K Run/Walk and Nautical Mile Kids Fun Run. In addition to sponsoring the half marathon, BayPort will host pre-race popup community events geared toward fitness and financial wellness leading up to marathon weekend. Stan Leicester is interim CEO of BayPort Credit Union. Peninsula Airport Commission and Air Jordan, LLC jointly announced the development of a $3 million hangar and office space complex at Newport News/Williamsburg International Airport. Air Jordan, LLC joins Smithfield Foods and ATAC, a division of Textron, as corporate tenants on the south corporate side of the airfield. The 14,830-square-foot hangar will sit on approximately 1.5 acres and serve as W. M. Jordan Company’s corporate hangar site. The undergraduate business degree program at Christopher Newport University’s Joseph W. Luter, III School of Business ranks among the top four in Virginia and top 45 in the country, according to new rankings from business education news outlet Poets & Quants. The Luter School ranks number 44 in the survey, placing it among the esteemed top 50 public and private business programs of all sizes in the U.S. The Luter School jumped nine spots from its 2017 ranking. In addition to the high ranking in alumni satisfaction, Christopher Newport earned a Top 45 mark for its career outcomes. That assessment is based on the percentage of students in the Class of 2018 with internships before graduation and with full-time jobs within three months of graduation. Christopher Newport joined other Virginia schools in the top 45 rankings, including the University of Virginia, the College of William & Mary and the University of Richmond. 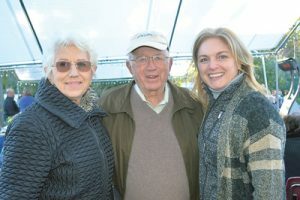 Virginia Living Museum hosted 585 guests at its all-you-can-eat 7th Annual Oyster Roast in November. The event raised $59,418 to benefit the museum’s educational programs and animal care needs. Mathews Lions Club, Waypoint Seafood & Grill, Phillips Energy, Sam Rust Seafood, and Stratford University culinary students provided the food. The evening showcased live VLM animals throughout the festival. Among the guests were (left to right) Suzanne (Suzy) Helderman and John Mattern with VLM’s executive director Rebecca Kleinhample. Food insecurity is a year-long reality for most of the individuals served by the Virginia Peninsula Foodbank. Support drops significantly after the holiday season. Newport News Commissioner of Revenue Tiffany Boyle recognized the challenge and has been instrumental in initiating a statewide food and fund drive. 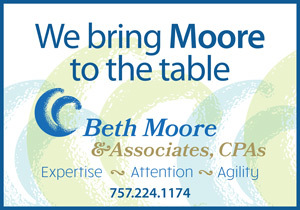 The “Commissioners and Cans” Food and Fund Drive takes place throughout the Commonwealth of Virginia February 4–15. This two-week drive is a competition to determine which Commissioner of the Revenue office raises the most food and funds to support its local foodbank during this time of year. The offices raising the most will receive recognition from the president of the Commissioners of the Revenue Association. 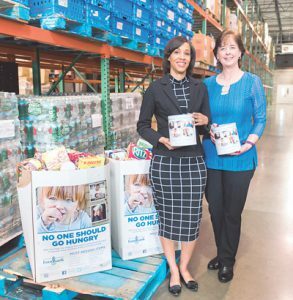 Boyle (left) is shown here with Karen Joyner, CEO of the Virginia Peninsula Foodbank. Top December agents for CENTURY 21 Nachman Realty’s Peninsula Office were Donna Bösze, top listing agent and top closing agent; Melanie Whitehead, top selling agent; and Jody Snider, top producing agent. by artist Stephen Hayes, composes 15 life-sized casts of the artist’s friends and family. The 15 statues, each confined by shackles and bound to a wooden shipping pallet, represent the 15 million African people forcefully brought to the New World. The series will run until April 28.